From being diagnosed with a learning disability and facing ridicule as a child to becoming the all-time leader in career yards-per-carry among running backs in the National Football League, as of 2017, Jamaal Charles’ life story would surely make a decent bestselling book. Read on to find out more about the former Kansas City Chief, who was selected in the third round of the 2008 NFL Draft and has gone ahead to feature in four Pro Bowls. Jamaal Charles was born Jamaal RaShaad Jones Charles on the 27th of December, 1986, in Port Arthur, Texas. As a child, he was diagnosed with a learning disability that made it hard for him to read. This inadvertently hindered his involvement in activities with other kids his age as he was always teased and mocked. In 1996, however, at around the age of 10, Charles’ life changed for the better as his athletic prowess earned him a participation at that year’s Special Olympics where he competed in track and earned a gold medal. His success in sports at an early age helped build his confidence as he went on to attend Port Arthur Memorial High School where he played football and ran track. Charles was outstanding in both sports, especially in his junior and senior high school years. In football, he earned the District 22-5A Player of the Year awards in both years as he was also named to the 2005 Parade All-America Football Team, among other awards and titles. In track, he won the 110m hurdles and 300m hurdles Texas 5A state championships in his senior year. After graduating from high school, Jamaal Charles enrolled at the University of Texas where as a true freshman, he helped his team win the national championship. He went on to play for the school for three seasons, ranking fourth on the list of total rushing yards by a Texas player, before deciding to forgo his senior year and enter the 2008 NFL Draft where he was selected by the Kansas City Chiefs with the 73rd overall pick. Charles played for Kansas City for nine years, during which he was highly ranked by his colleagues in five different seasons (2011, 2013, 2014, 2015, and 2016) as one of the NFL Top 100 Players. During this time, he also made the Pro Bowl on four occasions (2010, 2012, 2013, 2014), had 2 first-team All-Pro selections (2010, 2013), and led the NFL in rushing touchdowns in 2013 before he was released by the Chiefs in February 2017. Charles went on to play one season with the Denver Broncos before joining the Jacksonville Jaguars in October 2018. His stay with the Jaguars turned out to be very brief as he was released a few weeks later, making him a free agent. 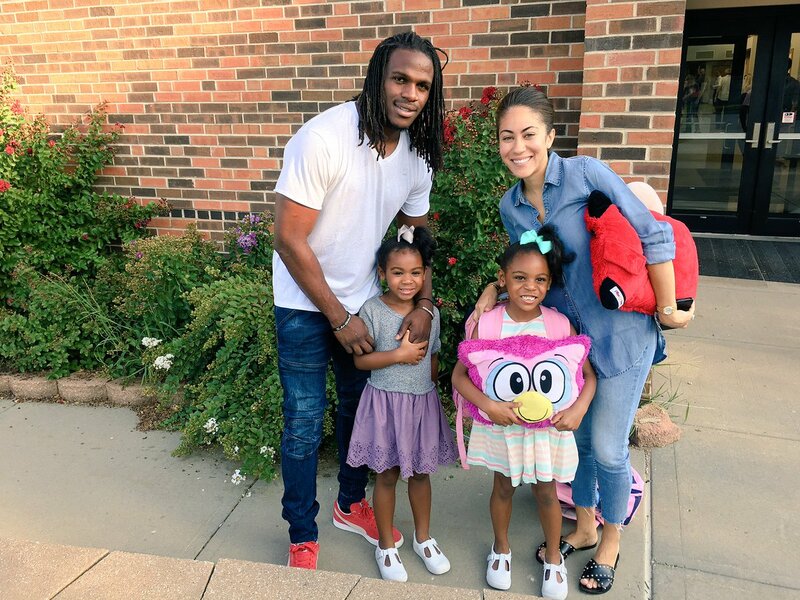 Jamaal Charles is married to Whitney Golden Charles, whom he has known since they were in eighth grade. The couple got engaged on the 3rd of July, 2011 and got married a year later, on the 2nd of June, 2012. Together, they have two daughters named Makaila Jae and Makenzie. Whitney is a full-time mother, however, she is also very much involved in her husband’s Youth Matters Family Foundation through which he holds free football camps for kids every year. Jamaal Charles has a net worth estimated to be around $13 million. The four-time Derrick Thomas Award recipient was able to amass his wealth through his salaries over the years in the NFL as well as from endorsements. In 2008, when he was drafted by Kansas, Charles put pen to paper on a 3-year $1.75 million contract. In 2010, he extended his contract with the side for 5 years for $32.5 million. Four years later, Kansas again extended his stay for 2 more years by offering him an $18.1 million contract. In February 2017, Kansas released Charles and gave room for him to sign a 1-year, $2.5 million contract with the Denver Broncos. It is not clear how much the Jacksonville Jaguars paid him for the few weeks he spent with the side. Jamaal Charles has a height of 5 feet 11 inches (1.80 m) and weighs 200 pounds (91 kg). The running back, who recorded 4.38 seconds in the 40-yard dash and a vertical jump of 30 1⁄2 inches (0.77 m) at the 2008 NFL Combine, further has an arm length of 32 1⁄8 inches (0.82 m) and a hand size of 8 3⁄4 inches (0.22 m).